NEWS: NEW PICTURE BOOK WITH ALAIN VERSTER! Alain Verster is the wonderful artist that I got to work with twice: in THE DOVE THAT COULDN'T DIVE and VASCO THE LITTLE SOCCER PIG. Books that traveled over the globe, with editions in Germany, Norway, Brazil, Denmark and China. And now our third book is out! 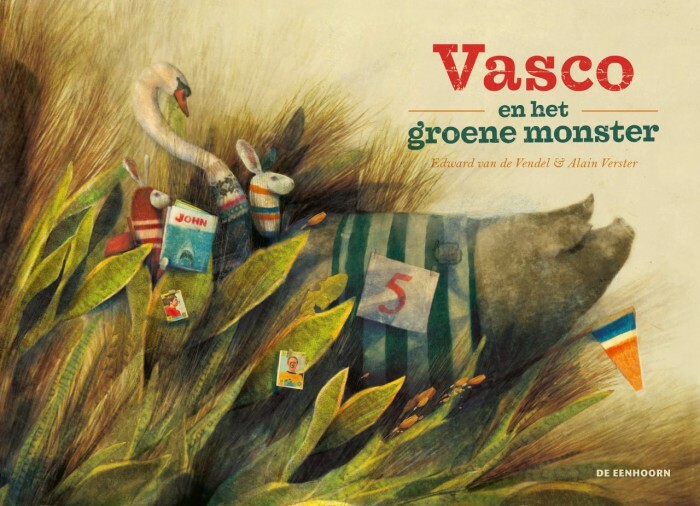 VASCO AND THE GREEN MONSTER was published by De Eenhoorn and tells the story of a sweet pig that is crazy about 'his' Matteo - the little boy at the farm. But then he hears Matteo is getting a new present, and the present is called John. Vasco's envy grows and grows: is this John a monster? A green monster? Alain Verster and I are planning more books, but for now it's all about our colourful Vasco. Rights can be negeciated here, by the way.